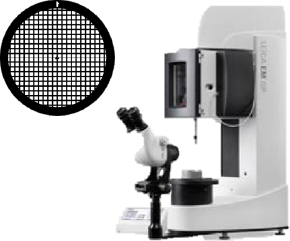 The SXT100 uses the same cell preparation, cryo-fixation and image reconstruction procedures as with cryo-transmission electron microscopy (cryo-TEM). This facilitates easy integration into cell imaging laboratory workflows and minimises the training required to operate the microscope. 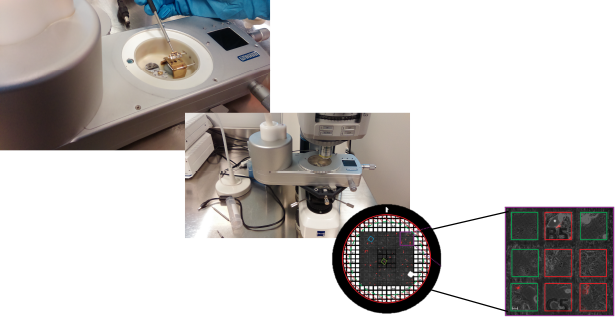 Cells prepared by routine culture methods are grown on carbon-coated gold electron microscopy finder grids. After incubation the grids are screened in-vivo under a light microscope to check for confluency and expression of transfected proteins. Gold fiducial markers are then added to the grid to aid post-acquisition data alignment. The grid is then plunge-frozen in a cryogenically cooled fluid, typically liquid ethane, after blotting away excess fluid. The water in the sample freezes so rapidly that it does not crystallise. The sample is transferred to an inverted light microscope, where individual, isolated cells can be identified for subsequent cryo-SXT. A dedicated cryo-LM stage keeps the sample in its vitrified state during grid inspection so that the grid positions of targeted cells are recorded before moving to the cryo-SXT. 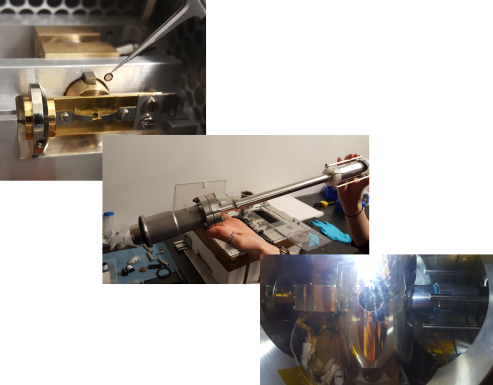 The grid is loaded into a cryo-holder that is inserted directly into the microscope via a vacuum load lock mechanism. The SXT microscope contains a visible light microscope set up to detect fluorescence, which aids in the identification of cells suitable for SXT data collection. Then a series of 2D images is acquired from different perspectives as the sample is tilted up to +/- 60 degrees. 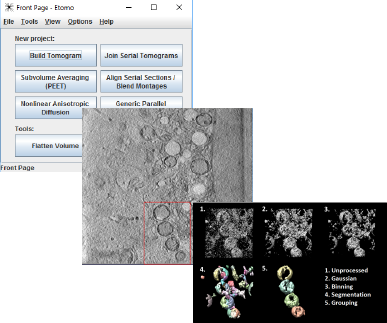 Using these and other available packages such as UCSF Chimera and Amira, the user can segment, colour, and cross-section the model in a variety of ways to enhance its display and presentation.